Kingston’s Got Skin in the Game. The Lincoln Park Power Plant Final Scope Delay and Rescheduled Balloon Test. At last week’s Town of Ulster Workshop meeting, we learned that the Town of Ulster Town Board as Lead Agency did not submit the Final Scope to Glidepath (the applicant) to make the April 2nd deadline. What happened? DEC Requests Additional Air Quality Review and Comments. City of Kingston’s Got Skin in the Game. 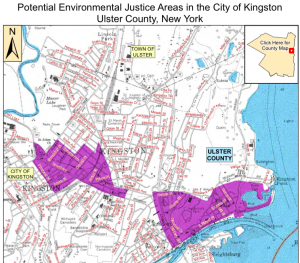 In the the City of Kingston, there are two “Potential Environmental Justice Areas“. One in Uptown and in the Rondout, downwind of potential emissions produced by the gas-fired power plant that is being proposed. “If the air data indicates that the project’s potential impact area includes the Potential Environment Justice Area the applicant will be required to incorporate environmental justice into the permitting process and prepare a public participation plan as described in the attached environmental justice fact sheet.” state officials wrote. Finding that the project is located within an area of potential historical or archeological significance and may have visual impacts on the Hudson River National Landmark Historic District. Requesting an evaluation of whether the project is consistent with the state energy plan and suggested the developer consult with the state Department of Public Service. Noting that the project site has the potential for a “high abundance and diversity of amphibians and other vernal pool associated wildlife.” State officials added that there are also potential impacts on habitat for the Northern Long-eared and Indiana bats due to planned tree removal. A reminder that some of the property appears on federal wetlands maps and that the developer will need to conduct surveys to establish precise boundaries. Rescheduled Balloon Tests Monday, April 9th at 8:00am. 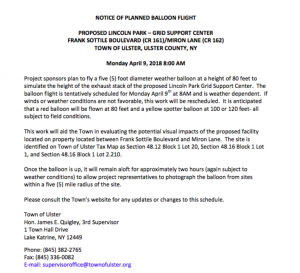 The Project sponsors plan to fly a five (5) foot diameter weather balloon at a height of 80 feet to simulate the height of the exhaust stack of the proposed Lincoln Park Grid Support Center. The balloon flight is tentatively scheduled for Monday April 9th at 8AM and is weather dependent. If winds or weather conditions are not favorable, this work will be rescheduled. It is anticipated that a red balloon will be flown at 80 feet and a yellow spotter balloon at 100 or 120 feet- all subject to field conditions. This work will aid the Town in evaluating the potential visual impacts of the proposed facility located on property located between Frank Sottile Boulevard and Miron Lane. The site is identified on Town of Ulster Tax Map as Section 48.12 Block 1 Lot 20, Section 48.16 Block 1 Lot 1, and Section 48.16 Block 1 Lot 2.210. Once the balloon is up, it will remain aloft for approximately two hours (again subject to weather conditions) to allow project representatives to photograph the balloon from sites within a five (5) mile radius of the site. Not sure where the best place would be. Cannot stop on the bridge. Maybe the consultants have obtained permission. Suggested Poet’s Walk Park instead. Not sure if Ryan Road is the best spot. May be too far south. This is too far. Only the plume would be an issue. Important location. Residents should be aware. Scenic Hudson will also check.